Abstract — Web application script crashes and malformed dynamically generated web pages are common errors and they seriously impact the usability of Web applications. Static analysis tools for webpage validation cannot handle the dynamically generated pages that are ubiquitous on today’s Internet. We present a dynamic test generation technique for the domain of dynamic Web application, utilizes both combined concrete and symbolic execution. The technique generates tests automatically, runs the tests capturing logical constraints on inputs, and minimizes the conditions on the inputs to failing tests so that the resulting bug reports are small and useful in finding and fixing the underlying faults. We are implementing the PHP Programming language test using Apollo. This paper presents the survey on static and dynamic testing analysis, also compare the dynamic test generation of DART and Apollo Software web Tools. Our analysis present the Apollo is effective than the existing tools. Abstract — The complexity of wide-area routing configuration and protocol dynamics for Multi-homing requires mechanisms for expressing wide-area routing that adhere to a set of logical rules. This research work proposes a set of rules, called the routing logic, which can be used to determine whether a routing protocol for multi-homing satisfies various properties. This research demonstrates how this logic can aid in analyzing the behavior of BGP (Border Gateway Protocols) for multi-homing under various configurations and Autonomous Systems. Research also speculate on how the logic can be used to analyze existing configuration in real-world networks, synthesize network wide router configuration from a high-level policy language, and assist protocol designers in reasoning about new routing protocols. The motivating objective of this research work is to identify important characteristics, metrics of routing tables, flaws and explore well-known abilities associated with it and find out to implement the updates, which provide the foundation of the proposed Border Gateway Protocol (BGP) workload model. Abstract — Facility location problem have several application in telecommunication, transportation and distribution etc. one of the most well-known facility location problem is the p median problem. We use genetic algorithm to solve the capacitated p-median problem. In this paper we solve a real problem and give their computational result. Abstract — Optical amplifiers are key elements of any fiber-optic communication system. Even though modern optical fibers have losses below 0.2 dB/km, a repeated amplification of the transmitted signal to its original strength becomes necessary at long enough distances. One solution for signal regeneration is the conversion of the optical signal into the electrical domain and subsequent re-conversion into a fresh optical signal. This paper has proposed the investigation of the soliton and MTDM techniques to be processed to handle both bit rate and product either per link or per channel for cables of multi-links (40-240 links/core). Two multiplexing techniques are applied, ultra wide wavelength division multiplexing (UW-WDM) and ultra wide space division multiplexing (UW-SDM), where maximum number of transmitted channels is processed to handle the product of bit rate either per channel or per link for cables of multi-links. The soliton and MTDM transmission bit rates and products either per link or per channel are also treated over wide range of the affecting parameters. The amplification process is essentially independent of the details of the spectral channel layout, modulation format or data rate of the transmission. Abstract — Data mining techniques make it possible to search large amounts of data for characteristic rules and patterns. If applied to network monitoring data recorded on a host or in a network, they can be used to detect intrusions, attacks and/or anomalies. In this paper, we present “machine learning” a method to cascade K-means clustering and the Id3 decision tree learning methods to classifying anomalous and normal activities in a computer network. The K-means clustering method first partitions the training instances into two clusters using Euclidean distance similarity. On each cluster, representing a density region of normal or anomaly instances, we build an ID3 decision tree. The decision tree on each cluster refines the decision boundaries by learning the subgroups within the cluster. Our work studies the best algorithm by using classifying anomalous and normal activities in a computer networks with supervised & unsupervised algorithms that have not been used before. We analyses the algorithm that have the best efficiency or the best learning and describes the proposed system of K-means&ID3 Decision Tree. Abstract — In the present paper, Radio over fiber (ROF) transport systems have the potential to offer large transmission capacity, significant mobility and flexibility, as well as economic advantage due to its broad bandwidth and low attenuation characteristics. We have investigated parametrically and numerically the high performance of Radio over fiber communication systems over traditional optical communication systems using different coding formats over wide range of the affecting operating parameters. 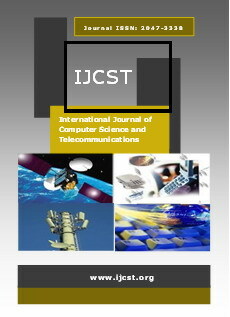 Moreover we have analyzed the transmission bit rates and products per channel based standard single mode fiber made of both silica-doped and plastic materials with using modified Shannon technique in addition to use different coding formats such as Return to Zero (RZ) code, and Non Return to Zero (NRZ) code for ultra long haul transmission applications. We have taken into account the bit error rate (BER) for ROF systems with comparing it with traditional optical fiber communication systems as a proof for improvement of signal to noise ratio. Abstract — For some critical applications such as the law enforcement, medical and military image system, it is crucial to restore the original image without any distortions. The watermarking techniques satisfying those requirements are referred to as ‘reversible watermarking’. Reversible watermarking is designed so that it can be removed to completely restore the original image. Considering the age of reversible watermarking which is just a decade to count, it has fetched enormous attention of researchers to boost of. Due to many researches in this field, it has become very difficult to judge an algorithm for a specific application. So a definite need arises to compare these algorithms on some criteria. In this paper, we present a comprehensive study of all basic algorithms which are reversible. Abstract — The fundamental problem the Grid research and development community is seeking to solve is how to coordinate distributed resources amongst a dynamic set of individuals and organizations in order to solve a common collaborative goal. The problem of service discovery in a Grid environment arises through the heterogeneity, distribution and sharing of the resources in different virtual organizations. This paper proposes a service discovery framework which is based on semantics. It gives an example of the Grid Job Submission Service written in DAML-S in order to show how service ontologies are implemented. This semantic approach allows a more flexible and dynamic matching mechanism based on semantic descriptions stored in ontologies.